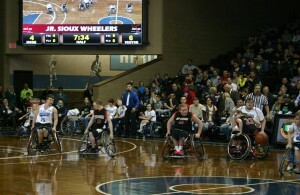 The Jr. Sioux Wheelers played at halftime of the Sioux Falls Skyforce game on Friday, December 27th. The Jr. Sioux Wheelers played a short scrimmage against the Nebraska Red Dawgs from Omaha, NE. To make the trip more worthwhile for the Red Dawgs, the two teams held a full scrimmage prior to the Skyforce game at the Pentagon. During that full scrimmage, some of the Skyforce players, Anthony Mason, Jr., Chris Ayer, Ryan Evans, and Henry Walker, came to the scrimmage and took pictures with the Jr. Sioux Wheelers. The kids were very excited to play at the Pentagon. 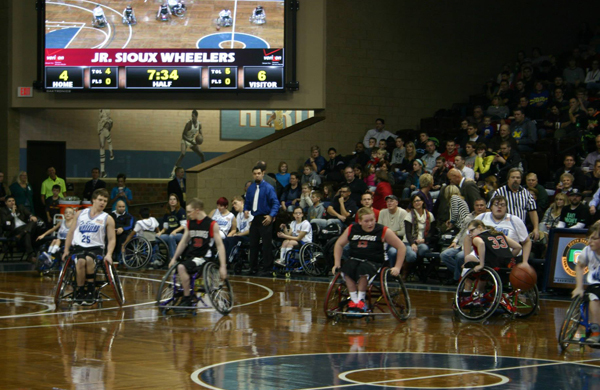 The Jr. Sioux Wheelers were contacted by the Skyforce after the Wheelers returned from their trip to the national tournament. Kyle Kapitan of the Skyforce and Brad Coleman from the Pentagon were the contacts to help get the event set up for the Jr. Sioux Wheelers. The Jr. Sioux Wheelers will be hosting the Junior National Wheelchair Basketball Conference Tournament in Dell Rapids on March 22nd and 23rd.